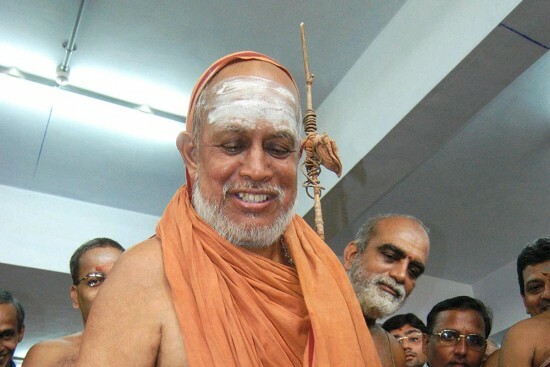 If the Kanchi Kamakoti Peetham positively deviated from its celebrated traditions during the past quarter cen­tury, the anci­ent Hindu monastic institution owes it to Jayendra Saraswathi’s charting an independent course for it after becoming the 69th Shankaracharya. This, sadly, led to an uncharitable campa­ign against the pontiff but least stopped his spirited efforts in transforming the ritualistic Math into a socia­lly vibrant centre of knowledge and activity. Back in early 1994, the grammar of the inward-looking Math in northern Tamil Nadu began changing into one of high-pulse activity. Jayendra, who had taken over as the sage of Kanchi five days before the death of Chandrasekhare­ndra Saraswati on January 8 that year, often tested the limits of orthodoxy. The new swami extended the areas of Math’s reach beyond its traditional adherents, exploring areas of social thrust. Jayendra was instrumental in the Math’s dir­ect service to people, beyond being a mere spiri­tual fountainhead. Today, it runs dozens of schools and hospitals besides a deemed university. Jayendra also rea­ched out to untouched bastis, attracting new devotees. His popularity swelled and brought multitudes of social, political and cultural leaders into interaction with him. As a spiritual guru, Jayendra was very different compared to his peers in the pantheon of Shankaracharyas—particularly vis-à-vis his immediate predecessor. That offbeat app­roach earned him detractors—and a prolonged smear campaign linking him with the murder of a Math inmate in 2004. In a state where Brahmins and Hinduism have borne the burden of unjust assault, Dravidian forces found it opp­ortune to force the government to act against the Math. Politically cornered, the then chief minister J. Jayalalitha mindlessly ordered Jayendra’s arrest without an iota of evidence. That led to nationwide uproar. In Tamil Nadu, on the contrary, a vicious anti-Math campaign was carried by political parties, intellectuals and activists. Even the media declared the acharya guilty. Millions of their peaceful spiritual followers cried in silence. Only one (English) newspaper opened a view to the other side, as I authored five counter-investigation articles. The third in the series opened thus: “On counter-investigation, we found the case against the Shankaracharya not just slippery, but actually groundless from day one. Not just that. It involves a bit of fabrication too. Yes, the fabrication to fix the Acharya. The police are running for cover. They may not give up yet and may fabricate more to put the case, which is dead, on life support system. But the case is irretrievably lost.” It spoke of a “dramatic turn” when the Kanchipuram Magistrate court saw two criminals on whom the police had exclusively relied to name the Shankaracharya as an accused having actually turned to accuse the police as the fabricators of the case itself. An angry government ordered my arrest. Not a single media house came to my help, but the judiciary prevented it from happening. A vicious ecosystem generated by anti-­Brahmin, anti-Hindu political leaders had ensured that even bail was denied to the Acharya. Finally, with ringing comments, the Supreme Court granted it to him. At this, a hostile government arrested Jayendra’s junior. Justice Narasimha Reddy (of the Andhra Pradesh High Court), while deciding a collateral PIL against Jayendra, heart-rendingly captured what he called as the denigration of the 2500-year old ancient, prestigious and glorious Math by “not only individuals, but also the State and the Press”. Noting the stoic silence of human rights activists, the judge said “a powerful section is celebrating or watching with indifference” the “perfidy against the Math” that had “shoc­ked the nation and beyond”. Justice Reddy likened the treatment to the acharya to what a hapless Draupati faced from the villainous Kauravas in the Mahabharata. Finally, in 2013, the trial court acquitted the swami and his junior, Vijayendra Saraswathi, besides all other accused. The verdict almost echoed my third counter-investigation article that had, within two weeks of the arrest, called the prosecution’s bluff. But the relief came after nine years of intense pain and humiliation to the acharya. All this for the successor of the most revered Mahaswami. Chandrasekharendra Saraswati (born in 1894) was a walking divinity. An epitome of modesty and simplicity, his tranquillity attracted millions, including renowned personalities from all walks of life. Whether it was author Arthur Koestler or Mahatma Gandhi or our prime ministers, all of them queued up to Chandrasekharendra. Even his detractors—the anti-Hindu Dravidian outfits—were sile­nced by the power of his calmness. Jayendra, in contrast, was outspoken. If the guru was introverted, Jayendra was outgoing. If the Mahaswami walked, Jayendra motored, even flew. If the former avoided fame, the latter enjoyed it. If the Maha­swami immersed in contemplation with the self, Jayendra involved in conversation with the world. Now, back to the old murder case. Jayendra, even after the acquittal, was hounded by hostile elements who kept on fastening imagined guilt on to him. Today, the swami is no more. The pain inflicted on Jayendra has died with him. But the intense pain which the millions of peaceful devotees underwent at the hands of a hostile state, egged on by the media and watched by the exponents of human rights, will remain a permanent scar in the political, judicial and media history of Tamil Nadu—as Justice Reddy had said. Will all those who heartlessly chased him for a decade introspect on what they did then so that they don’t repeat it ever? Whatever be the answer, the social and spiritual service of this saint with an endearingly forward-looking vision will outlive the taint that was tarred on him. The Math has only emer­ged stronger after that trial by fire. The 'Q' accounts aren't the target. The world is against secret stashing.